Stock #A107:IMMACULATE!!! Antique Style Fancy Engraved Anniversary Ring.....14K WHITE GOLD.... 1/2, 1 or 1.25 CARAT T.W. RUSSIAN CZs.... Gorgeous hand-made piece!!! Fits best with styles A110, A111, A111P, A104, A105, A404, A405... Beautiful, Hand-Crafted, top quality Jewelry workmanship!!!.... Nice heavy ring & shank. Also available in 14k Yellow and Platinum. 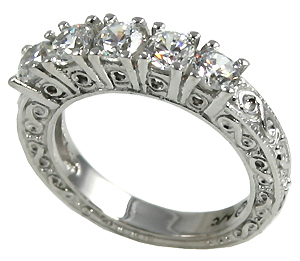 The 1.25 carat total weight version has the best detail and most weight. This item is made to order and takes 7-14 days.